When I left for college and set out into the world, I was armed with one critical tool in my arsenal: my handwritten cookbook. Granted, at that point in my life, I barely knew how to cook, having watched the Food Network for years, but picking up virtually no practical experience along the way. My cookbook was populated with only a few recipes that I had learned from Mom, and a few recipes that I had copied from her recipe collection that I knew I liked but had never helped her make. As I taught myself how to cook, I loving transcribed my favorite recipes into the book, creating an elite tome of only the best recipes in my repertoire that I turn to again and again. Some of those dishes have made it onto my blog over the years, but a lot of them exist only in that space because I figured they would be of interest only to me. For example, I figure nobody really cares about my spaghetti recipe, which is basically a set of instructions on how to doctor up a bottle of Ragu the way that my mom does. This is vitally important information for me, but probably not of general interest to other cooks out there. Over the years, however, my precious collection of recipes has been loved perhaps a bit too hard. The pages are covered in stains, some are tattered from the book having been dropped, and the binding is disintegrating. When I pointed out the carnage to Justin, and asked him to be gentle with it whenever he uses it, he came up with the idea of creating a Tastebook, a customized recipe book that you create online and have printed by the Tastebook company. He created one for his family using his grandmother's recipes as a Christmas gift a few years back, and he decided that he would do the same for me as a birthday gift. Though it takes a considerable investment of time and energy to enter all the recipes, you have the ability to add a photo for each recipe - something that was lacking in my homespun version - and you can order reprints and add recipes over time as it becomes necessary. It was really a perfect gift idea. Of course, the amount of effort necessary to undertake this task was lessened somewhat in my case because of my blog, from which Justin could simply copy and paste, and for which images already existed. However, not every recipe in my repertoire is represented on my blog, especially family recipes, dishes that I don't frequently prepare, and items that are not photogenic to the extent that I feel like nobody would want to make them based on the associated image. Justin is determined to include an image with every recipe, so I find myself newly motivated to dust off some of my old favorites, and challenge myself to take the best photos possible of some of the ugly ducklings in my oeuvre. Tonight, I tackled a recipe for chicken fingers, of all things. It is something that my mom used to prepare when I was younger, and it was one of my favorites, even though she rarely prepared them. When I transcribed her recipes, I included it out of nostalgia, but I never actually tried to make it, partially because my palate has changed and partially because I did not own the pizza stone required to make it until just recently. Now that I have one, however, there was no excuse not to revisit this recipe, so I stocked up on pre-fab croutons and found a place for this meal in our weekly meal plan. It was a simple enough dish to put together, and the garlic croutons add a novel flavor that is interesting enough for adult taste buds, but simple enough to appeal to kids. Baking the chicken makes the dish healthier than the fried alternative, but with the processed croutons, I wouldn't exactly call it healthy per se. I don't really have very many kid-friendly recipes here at "The State I Am In," so if you are looking for something to feed your children for dinner tonight, this may be your best bet. 1. Crush croutons in resealable plastic bag. 2. In a medium bowl, combine croutons, cheese, parsley, and garlic salt. 3. Whisk egg whites and water in a small bowl. 4. 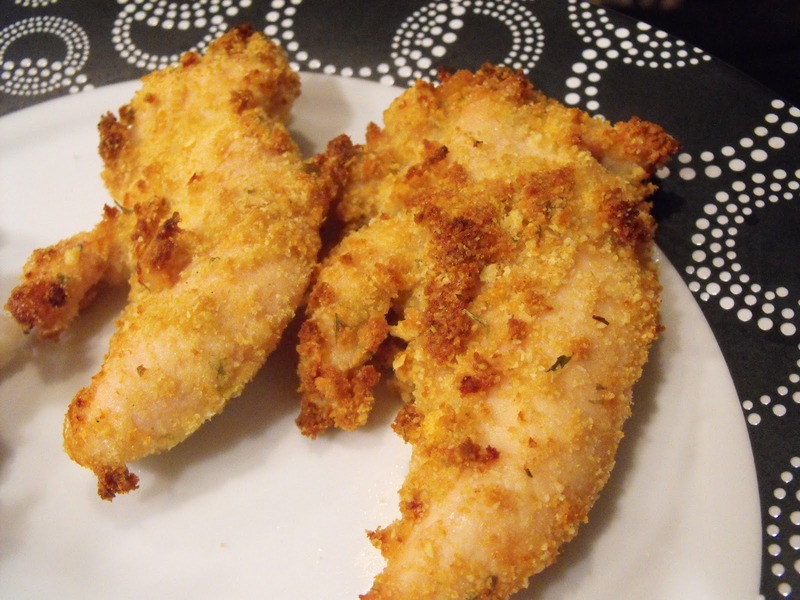 Dip chicken pieces into the egg mixture, then into the crumb mixture to coat evenly. 5. Bake for 14-16 minutes or until chicken is no longer pink in the center. You may wish to turn the chicken after 8 minutes.